As per analysis by Transparency Market Research (TMR) the global wood vinegar market has a slightly consolidative vendor landscape. Key players such as Dongying Runyi Biotechnology Co. Ltd., Canada Renewable Bioenergy Corp., Merck KGaA (Sigma Aldrich), Kerry Group PLC, and Frutarom Industries Ltd. are operating in the global wood vinegar market. Experienced companies are focusing on facilitating partnerships with several players to widen their global presence. 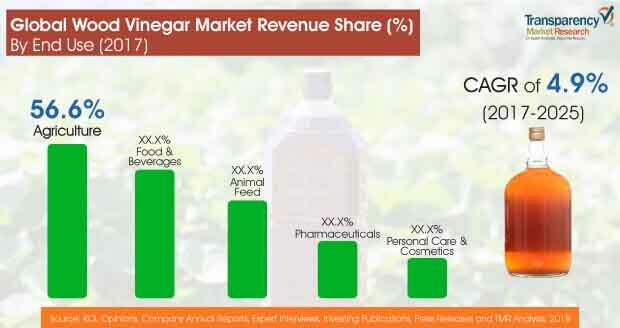 According to the report by Transparency Market Research, the wood vinegar market is projected to reach a value of US$ 1,896.8 mn by 2025 end from the value US$1,295.4 mn in 2017. The market is likely to expand with a stellar CAGR of 4.9% over the forecast period from 2017 and 2025. By end use, the agriculture segment is expected to be the most lucrative segment in the global market and is expected to remain over the forecast period. however, the food and beverage segment accounted for the 60.1% of the share in 2017 and is expected to be the dominant segment over the forecast period. On the basis of production method, slow pyrolysis segment is projected to be account for a 48.2% share in the overall market by the end of 2025. On the basis of region, Asia Pacific and Europe are dominating over the forecast period followed by North America. This growth is attributable to the rapidly increasing population coupled with growing westernization across developing countries in the Asia Pacific. Wood vinegar is a result of charcoal creation, and is delivered from the ruinous refining of wood. Wood vinegar has a few applications where it tends to be utilized as a characteristic plant-determined pesticide, herbicide, plant development advertiser, contagious development enhancer, and in a few different applications. Biomass-based items are winding up gigantically appealing, and the presentation of powerful and increasingly proficient pyrolysis advancements has improved generally speaking yield, bringing about significant creation age. Besides, the developing buyer interest for natural nourishment items is convincing makers to acquire all 'normal' and 'natural' items to the marketplace. Organizations in the market are concentrating on new item dispatches, and brining items in the marketplace that are common and in the meantime entirely reasonable. Wood vinegar is acquired from charcoal, and is broadly utilized in the agribusiness business so as to improve the general generation of yields. Wood vinegar goes about as a manure, where it improves soil fruitfulness, permits better take-up, and decrease of up to half of composts, herbicides, and pesticides. A portion of the limitations that are conceivably confining the development of the wood vinegar market is that wood vinegar is delivered from a few natural sources. Notwithstanding, there are different difficulties related with the sourcing and assembling of wood vinegar from these comparative common sources, which may prompt repeatable/reliable outcomes, hence constraining their utilization over a few mechanical areas. Moreover, a significant part of the wood required for charcoal generation originates from characteristic timberlands, prompting woodland gathering. Charcoal creation is one of the real purposes behind deforestation over the globe. As the way of life crosswise over created and creating nations rises, the interest for charcoal and its results, including wood vinegar for vitality generation, additionally increments. This has pushed governments to discharge guidelines on the creation and dissemination of charcoal and its subsidiaries, in this manner constraining by and large charcoal generation, subsequently the creation of wood vinegar.